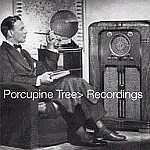 Review: "Porcupine Tree: Recordings" - Sea of Tranquility - The Web Destination for Progressive Music! This new CD by Porcupine Tree is actually a collection of B-Sides and rarities, songs that were left off the last few CD’s, and a full-length version of “Even Less” from the excellent Stupid Dream album. In today’s day and age where fans clamor for every hidden song ever recorded by a band, this collection should satisfy fans of the mighty English band. "Buying New Soul” starts things off in a dark fashion, and even though it was recorded in early 2000, it is not really representative of the tracks from Lightbulb Sun, the bands latest release. Steven Wilson adds an intoxicating vocal over some spacey keyboards and a liquid guitar solo, which makes up for a real depressing yet satisfying ride. The band combines their Beatles influence with some bizarre space rock instrumentation on the upbeat “Access Denied”, while on “Cure for Optimism” Wilson and company strives for a more bleak songwriting approach. A rare return to their more experimental stage can be heard on the intriguing “Untitled”, which features lots of keyboard noodling, cello, and otherworldly guitar histrionics from Wilson. After a generic sounding little ditty called “Disappear” the band returns to the more psychedelic sounds of “Ambulance Chasing”, complete with squonking sax solos. The CD ends with the B-Side to the “4 Chords that Made a Million” CD single, titled “In Fromaldehyde”, the thirteen minute version of “Even Less”, and the previously unreleased “Oceans Have No Mercy” from the Stupid Dream sessions. While the world waits for the next full length Porcupine Tree studio release, this collection of rarities should hold us over. It’s interesting to listen here and compare these songs to what actually made the albums they were intended for. Although on their own they are quite good, it is apparent that these songs are all very different, and perhaps better belong on a compilation like this.